To a lobster connoisseur, you think only of California’s Spiny Lobsters because of its excellent sweet taste. When thinking of those that fish lobsters, there is only one; San Diego’s La Jolla legendary fisherman, Donnie Tomlinson. Donnie grew up in La Jolla, his dad owned La Jolla Cab, whose office was right next to Kramers Gas Station. They lived by the then, La Jolla High/Middle School. One of the early stories is how his twin sisters had to flip coins of who was going to drop and pick Donnie and Jack MacPherson off in a limo (his dad rented out) when they would go spear fishing at La Jolla Shores. They were only 10 years old. Stories of Donnie’s undomesticated behavior started young – one night Donnie, Willy Ronolison, and Robert Rakestraw chopped down a tree at the school and got caught. Their punishment was to replace the tree, and nurture the tree until it got to the size of the tree they cut down. If the tree died, they had to start all over again. Another was how Donnie and Rakestraw used to have puking contests at the black bar on Girard St, called “The Den.” Obviously, the barmaid (and threaten to quit) hated when both of them came in. Donnie would always win! Beside the untamed side to him, Donnie first started fishing for the Spiny Lobsters when he was about twelve years old. He made his first traps out chicken wire and rebar that he “conveniently” gathered from the surrounding neighborhoods. The California Spiny Lobster is by far the best tasting of all lobsters. No claws on this one, but a ton of more meat in the tail. He would get up at 3am to pull and set his traps, where he had placed them at WindanSea’s Horseshoe and/or Simmons, after which he would go to school. During school he would fall asleep at the desk. After school he’d go back to pull and reset his traps, using bait from discarded fish from the local markets. He would sell these 2-4 lbs lobsters around the neighborhood between .50- $1 apiece. Not a bad deal even back then. When he got older and during the summer (off season for lobster) Donnie would go out on the tuna boats when San Diego had a fishing fleet. His first captain was the legendary, George Zarkos. Donnie fished for a couple of years, including a trip on an albacore boat. These fishing trips did not last long. “To much work,” he was quoted as saying and of course this was, “The Good Old Days,” when catching tuna was done by using poles with barbless hooks. Two or three poles were used depending on the size of the tuna. It was back breaking work. Donnie finally saved enough money (about 10 grand back then) to buy his first skiff, outboard engine, trailer and truck and started fishing off Point Loma, Del Mar and La Jolla. Since he was a young man, Donnie was a consummated waterman. Anything that could be done or on under the water, Donnie could do it, and do it better than the rest. Donnie favored the Woodward Skiffs, made by legendary boat builder, Dale Woodward and bought at least one from Gordo Culbertson. These skiffs were wood and fiberglass, with foam bottoms; the perfect skiff for San Diego waters. It was said, they ran so smooth, one could cut a diamond on them going through 5-6 feet of choppy waters. His skiff was used as a support in Mac Meda’s abalone dive contests many times. Donnie was a big man, at 6’6”, he also had equally big appetite for life, hard work, and for drinking. Everything he did, he went full bore. Right or wrong and was fully prepared to face the consequences of his actions. One of his best friends was Percy Turner, who knew Donnie since school. But he really got to know him through a mutual friend Ronnie “Muzz” McConnaughey when they organized trips to Mexico in the late 1960 and 70s where they would drive down. At the time that was an adventure. On his first trip, Percy discovered what a great guy Donnie was. If Donnie befriended you, you had a friend for life. Donnie had a remarkable sense of humor, for example, he had pet names for all of his family, friends. His dad was “Steel Head.” His mom was “Pearly Gates.” He called Percy, “King Tut,” which to this day, Percy can not figure out why. These pet or nicknames made little sense to everyone, except Donnie. The trips to Mexico became Donnie’s vacation of choice. There usually destination was Matazlan, but they also went to Guymas, Puerto Vallarta and La Paz and Cabo, before any of them became tourist traps. The vacation gang was, Muzz, Donnie, Jack MacPherson, Bob Barnhill, “Birdrock,” Bill Hotchkiss, Richard Koeppke, Larry Chilicote, Phil Brown, Percy Turner, and several more. Despite the fact that many have passed away, they had fun. They were all addicted to excessive drinking, skin driving, fishing and exploring Mexico. One time the gang was getting a little rowdy at Lupies Bar in Matazlan and the Federalies were called in. Donnie’s toweling frame stood up and Jack laid down on the floor all ridged. Donnie pressed Jack over his head. Needless to say, the whimsy Federalies jaws dropped to the floor and could not depart fast enough. Percy explained, it was some of the best memories of his life, particularly those of him going out with fishing with Donnie. One time it was for a month straight on every Saturday morning with a pounding headache from the night before. It did not matter if he was pulling traps by hand before the two-stoke engines did the work, or dropping nets off of La Jolla for white sea bass and slipping on blood on the deck (that was a good thing) … it was all fun. Donnie died just three days before his 60th birthday. Hundreds of people attended his wake at Mission Bay jetty, making it the largest wake in Mission Beach history. For almost two hours the eulogy seemed endless, tears, laughs, stories and lots of beers and toasts were shared by all. 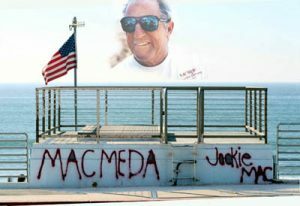 He will be truly missed, a San Diego incomparable fishing legend and a Mac Meda forefather. I am in Baghdad Iraq, here with Tim Tomlinson. I work with him, he is one of the best men I’ve ever met. Tim Tomlinson. There is a name I have not heard in years. You remember me, I think. notcivil at cox dot net Change the letters and send me an e-mail. I am Donnies nephew my dad is Richard Tomlinson Donnies brother. Some of my best memories are going at 3am and pulling gill nets with my uncle I will miss him alot. 1. The Tomlinson family goes way back in La Jolla history. In the book ‘A Parish by the Sea: a history of Saint James-by-the-Sea Episcopal Church’ by Rev. Lawrence Waddy, Donnie’s Great Grandmother, Sarah Tomlinson, was one of the church’s founding grande dames. Her daughter, Frances Tomlinson, was one of St. James key members in the formative years, and had been at parties at the McKinnley White House. Interestingly enough, fellow fishing buddy, Scratch’s Great Grandmother, Mrs. Good (her daughter married Nathan Rannells) was also part of a church group called ‘The Old Ladies of La Jolla’, which also included Ellen Browning Scripps. 2. I had only known Jack a few weeks in the summer of 1984. One night, we were in Pacific Beach and he stopped behind a truck, which had the bumper sticker, ‘Jesus was a Gill Netter’. “Just want to say hello,”. In we went. Donnie was on the couch, recooperating from surgery. Baby Jack was 2 years old. Laurice was exactly the same. 3. Donnie was known to party it up in his younger years. One night, he was whooping it up at a local tavern, and the bartender was getting ready to page San Diego’s Finest. Jack pulled the guy aside and whispered, “Call his mother,”. A few minutes later, Pearl Tomlinson walked through the tavern’s front door. The minute Donnie saw his mom, the party was over. I heard she grabbed him by the ear and that was that. Never underestimate the power of a La Jolla mom. 3. Winter surf. In the 50s, Jack and Donnie headed out diving, just north of the Cove. Jack realized he was nose-to-nose with a shark. He said it was the fastest swimming ever. Records were set. 4. November 1998. Donnie’s Memorial. All of a sudden, trucks are rumbling through the parking lot of South Mission. I looked back and realized the sound was the sound of Fire Trucks. A Fire Truck stopped at the memorial and several of the guys stopped by to pay their respect.